This is an interview with Josefin Wikstrom, who has been practicing yoga for the past 24 years. She has been dancing since she was a teenager, and teaching yoga the past 10 years in Sweden and internationally. She is studying dance and creative movement therapy with Tripura Kashyap in India, and has been a part of the Swedish Prison Yoga Team since 2010. Currently, she is developing a collaboration between the Swedish Prison Yoga Project and the one established in San Quentin State Prison in CA by James Fox. She has spent part of the each past nine years supporting dance and yoga programs in Mumbai for underprivileged children, youth, and women, where she works with Indian dance therapists and yoga teachers. Last year Sweden took in over 160,000 asylum seekers, the most per capita in Europe. Josefin is also working with some of the refugees fleeing increasing conflict and deprivation in the Middle East, Africa and Asia. Learn more and contact Josefin through Kaivalya Yoga Project. My motivation comes from my own experiences. I went through a childhood trauma being sexually abused and threatened by a person I looked up to. My whole world was turned upside down. I was not able to trust others; I had anxiety attacks and generally chaotic behavior. Finding a yoga practice and dance was my way to freedom from these feelings and memories. The yoga healed me from the inside out and the dance from the outside and in. I felt if I could experience relief, this needs to be shared with others. Now my motivation has changed in the way that I am sharing these moments with both the refugees and the women; experiencing stillness together, I feel a strong connection with them. My inspiration is being a part of this process, and also in being present for them. Is there a standout moment from your work with these groups? Every time I see the women dance, encouraging each other not to give up, and see women who normally fight with each other laugh and have fun together, these are big moments. Also moments in meditation where the women are completely still, closing their eyes breathing together, that always brings tears to my eyes, as it is so rare in this chaotic environment. “For the first time in my life I am truly in the moment, I have found peace here inside myself, and it was here all the time while I was running away from my self. Now I might be a refugee in the eyes of the government, but for myself I have reached home.” This man is now a great inspiration to the other refugees. What did you know about these groups before you began teaching? What were some of the assumptions you had about them, and how have those assumptions changed? Before entering the prison for the first time I was prepared to enter the storm, I expected it to be a huge challenge. I was expecting the women to be tough, and some were! I already knew about some of the women from headlines in the news. It was a challenge having 20 hyperactive women in front of me in a situation that is anything but positive. But as we started to move together it all fell away, and the tough masks melted. The practice allowed us to meet on neutral ground. My assumptions have changed as I hear their life stories and understand even more where they are coming from. The yoga and the dance makes me forget about the past when I am with them. With the refugees I was approached by them asking if they could join my classes. I was happy for their interest. Before getting to know them I felt that maybe I was in over my head as I am not a therapist, and they all suffer from severe traumatic experiences. The gratefulness in the group is healing on its own; for them just entering a room filled with stillness and connection with other Swedish people, without communicating with words, is a big experience. In Sweden, 8-12 refugees can sometimes live in one room far out in the countryside. They are isolated from society, but they never have private quiet space. This, combined with their traumatic experiences, is a recipe for anxiety and chaos. What are some of the things your students have taught you? To keep it real! To teach only what I have felt and experienced myself. I feel that they have made me more humble. Working with them has given me some insight into peoples’ ability to adapt, no matter how hard the situation might be. They teach me so much, and I feel that, thanks to them, I am growing as a human. In what ways do you think yoga addresses some of the societal factors at play in the institution or population you work with? In what ways does it not? Yoga includes ethical guides for life called Yamas and Niyamas. I believe that these principles, especially notions of self-respect and how to treat others, are relevant to the women in prison. Also, simple things, like being able to take a few extra breaths before reacting, make a huge difference in their social interaction. In the Swedish Prison Yoga Project we also educate the guards and prisoners to become yoga instructors, which has created a more friendly atmosphere. The refugee program especially benefits from the concepts of Prathyahara and Dharana, that is to be able to be at peace and to keep focus. This creates a more peaceful atmosphere in a place where many different ethnic groups are living together. And acceptance of each other is creating better communication. We have a small group of both Christian and Muslim extremists in the area I live and teach, so in that way the yoga practice can sometimes be controversial. What advice would you give to anyone who is going to teach women in prisons and refugees? Be honest with who you are and the knowledge that you have, and if you feel nervous or insecure, just tell them. Keep it simple and real. When teaching these classes both for refugees and the women, I am following trauma-sensitive guidelines. This means giving freedom, using simple instructions, and inviting language. I am careful not to call anything therapy. I just teach open yoga classes but with this understanding. If you feel that a person in class is disturbing the others or showing signs of panic attacks or other major issues, advise them to seek professional help. Make sure to inform the students that the yoga practice can release strong emotions. There are great books by David Emmerson, Bessel Van Der Kolk, and also resources on James Fox’s Prison Yoga Project web site regarding trauma-sensitive yoga. What are some of your ideas about, or hopes for, the future of service yoga in Sweden in the next decade? Sweden is the one country in Europe that has welcomed the most refugees per capita; the need for yoga service is greater than ever before. We need to open our yoga studio doors and welcome these people. My hope is that more people will find the interest to study the benefits of a trauma-sensitive approach, and offer classes at least once a week to these groups. 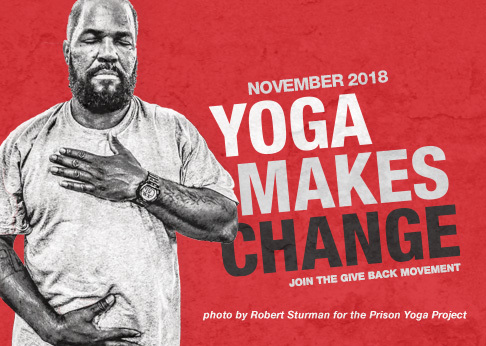 Are you interested in sharing yoga with men and women behind bars? Join the Prison Yoga Project for an upcoming training in your area.